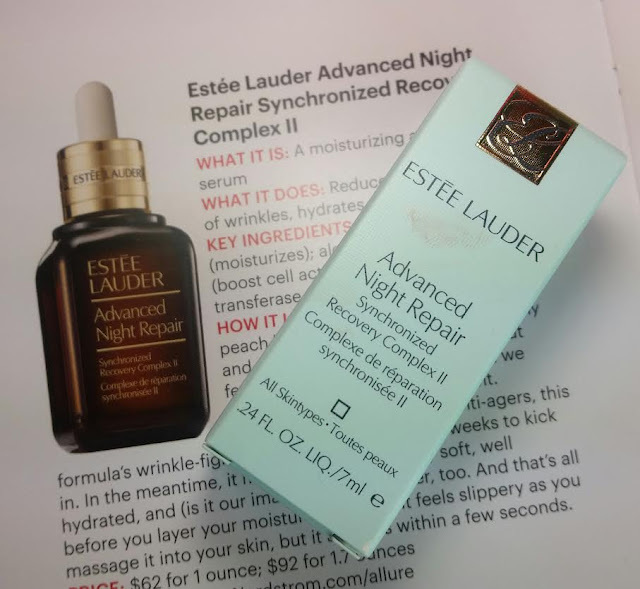 Estee Lauder Advanced Night Repair Sychronized Recovery Complex II- What a mouthful that name is. This is a decent serum with some beneficial ingredients so it's worth using if you are interested in trying it. Personally, it's not something I would buy for full price because you can get something just as good or better for a fraction of the retail price. But since I have it, I'm using it! Ingredients: Water, Bifida Ferment Lysate, Methyl Gluceth-20, PEG-75, Bis-PEG-18 Methyl Ether Dimethyl Silane, Butylene Glycol, Propanediol, Cola Acuminata (Kola) Seed Extract, Hydrolyzed Algin, Pantethine, Caffeine, Lectithin, Tripeptide-32, Ethylhexylglycerin,Sodium RNA, Bisabolol, Glycereth-26, Squalane, Sodium Hyaluronate, Oleth-3 Phosphate, Caprylyl Glycol, Lactobacillus Ferment, Oleth-3, Oleth-5, Anthemis Nobilis (Chamomile), Yeast Extract, Choleth-24, Hydrogenated Lecithin, Ceteth-24, Tocopheryl Acetate, Ethylhexyl Methoxycinnamate, Hexylene Glycol, Carbonmer, Triethanolamine, Trisodium EDTA, BHT, Xanthan Gum, Phenoxyethanol, Red 4, Yellow 5. 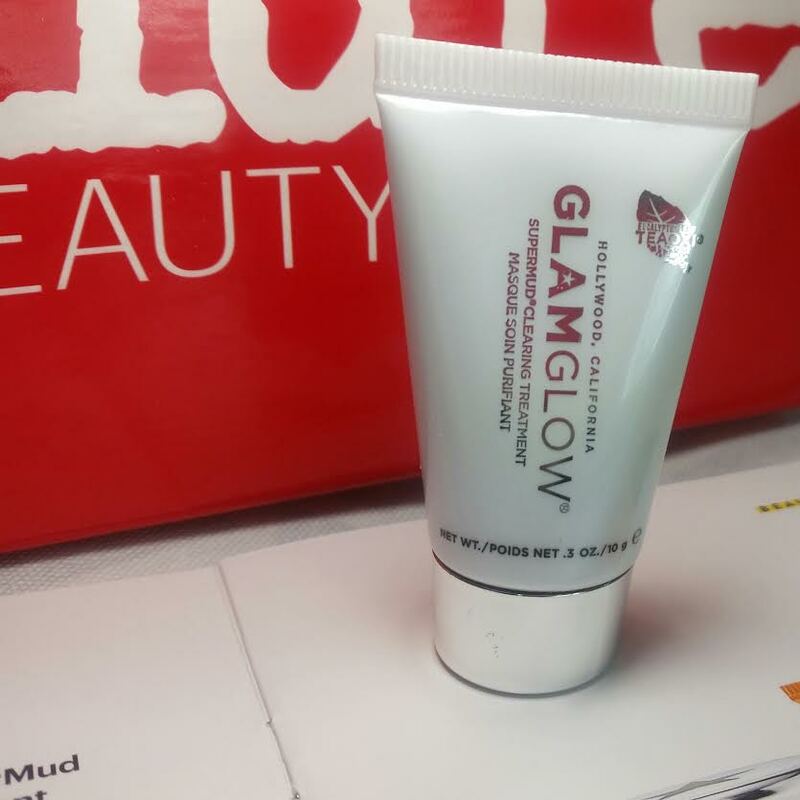 GlamGlow SuperMud Clearing Treatment- While I love the effect of clay masks, especially with charcoal in them, this mask has a confusing array of irritants added to it. Entirely unneccessarily, too. If you have sensitive skin, you may want to give this a pass because the Eucalyptus, Parfum and Peppermint oil may be triggers. I do like seeing glycolic acid and the AHA's in there, though I wish the salicylic one wasn't. Mainly because I have dry skin, though. This particular formulation is for oily/combination skin so it's not really appropriate for my skin to begin with. Since I currently LOVE my Origins Charcoal Mask, I'll pass this on to someone with oily skin who will love it more than I can. Ingredients: Water, Kaolin, Magnesium Aluminum Silicate, Sodium Hydroxide, Eucalyptus Globulus, Mandelic Acid, Charcoal, Parfum [Benzyl Benzoate, Linalool], Glycolic Acid, Lactic Acid, Pyruvic Acid, Salicylic Acid, Xanthan Gum, Aloe Barbadensis Leaf Juice, Maltodextrin, Iron Oxides, Peppermint Oil, Butylene Glycol, Glycyrrhiza Glabra Root Extract, Glycerin, Chamoilla Recutita Flower Extract, Calendula Officinalis Flower Extract, Cucumis Sativus Fruit Extract, Hendera Helix Extract, Symphytum Officinale Leaf Extract, Phenoxyethanol, Ethylhexylglycerin, Caprylyl Glycol, Hexylene Glycol, Ethylhexylglycerin, Phenoxyethanol, Potassium Sorbate, Sodium Benzoate, Tartaric Acid. 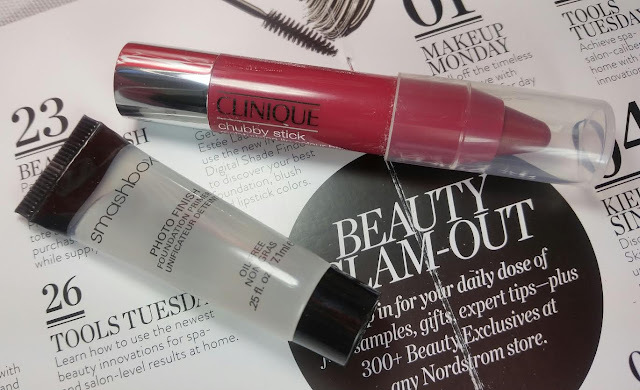 Clinique Chubby Stick in Super Strawberry- I don't know about you but the more Clinique Chubby Sticks I have, the better. I love these. I have bunch of them in a variety of colors (but not this one!) and you can probably always find one color or another in any of my handbags. I like it because it's hydrating and sheer enough that you can swipe it on without fear of coloring outside the lines. Since I'm not really into dramatic makeup, the subtle color works well for me. 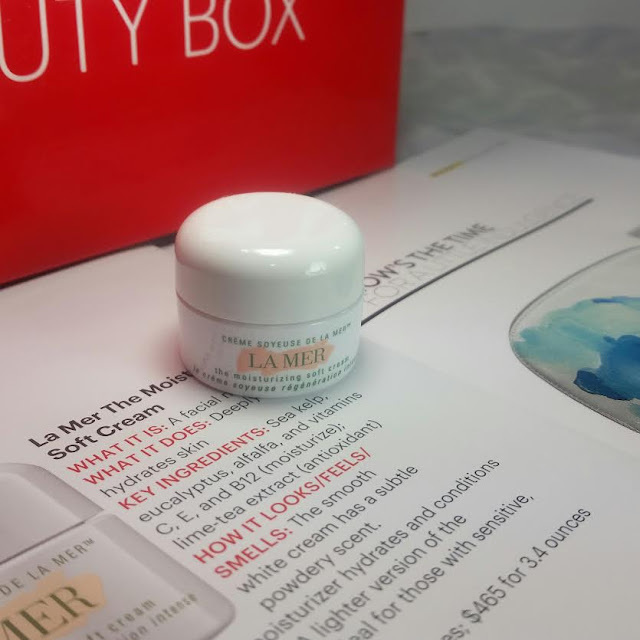 La Mer The Moisturizing Soft Cream- It's been kind of strange that La Mer is popping up in subscription boxes. I thought they would be much too exclusive for that kind of thing. But at their ridiculous prices they probably have a lot of money to make samples with. This product is waaaay overpriced for what's in it, let me say that. Just like with the Estee Lauder product, you can get better ingredients for far less expense. Please keep in mind that this product uses shea butter (a common irritant) as a moisturizer, so if you're sensitive at all, you'll want to stay away. I find it strange that it has hydrogenated vegetable oil in it, too. Why??! For those with sensitive skin, you may want to stay away from this because of the eucalyptus oil, fragrance, Citronellol, Geraniol, Linalool and Limonene which all have varying degrees of irritation possibilities. Ingredients: Algae (Seaweed) Extract, Cyclopentasiloxane, Petrolatum, Glyceryl Distearate, Phenyl Trimethicone, Butylene Glycol, Hydrogenated Vegetable Oil, Cholesterol, Butyrospermum Parkii (Shea Butter), Steareth-10, Dimethicone, Glyceryl Stearate SE, Polysilicone-11, Sesamum Indicum (Sesame) Seed Oil, Medicago Sativa (Alfalfa) Seed Powder, Helianthus Annuus (Sunflower) Seedcake, Prunus Amygdalus Dulcis (Sweet Almond) Seed Meal, Eucalyptus Globulus (Eucalyptus) Leaf Oil, Sodium Gluconate, Copper Gluconate, Calcium Gluconate, Magnesium Gluconate, Zinc Gluconate, Tocopheryl Succinate, Niacin, Sesamum Indicum (Sesame) Seed Powder, Water, Citrus Aurantifolia (Lime) Peel Extract, Laminaria Digitata Extract, Crithmum Maritimum Extract, Salicornia Herbacea Extract, Plankton Extract, Chlorella Vulgaris Extract, Glycine Soja (Soybean) Seed Extract, Glycerin, Caffeine, Sea Salt, Micrococcus Lysate, Diethylhexyl Succinate, Adenosine Phosphate, Creatine, Hydrolyzed Algin, Isocetyl Stearoyl Stearate, Cetyl Alcohol, Sucrose, Acetyl Hexapeptide-8, Glucose Oxidase, Polyacrylamide, Acetyl Carnitine HCL, Glucose, Caprylic/Capric Triglyceride, C13-14 Isoparaffin, Tocopheryl Acetate Tetrahexyldecyl Ascorbate, Sodium PCA, Glycosaminoglycans, Urea, Distearyldimonium Chloride, Dipalmitoyl Hydroxyproline, Sodium Hyaluronate, Laureth-7, Lecithin, Trehalose, Polyquaternium-51, Lactoperoxidase, Hydroxypropyl Cyclodextrin, Cyanocobalamin, Pentylene Glycol, Fragrance (Parfum), Disodium EDTA, BHT, Citronellol, Hydroxycitronellal, Geraniol, Linalool, Limonene, Potassium Sorbate, Phenoxyethanol. VERDICT: Well, I can't complain when La Mer shows up in a box (even if I'm not enthused with the product, it's a nice high end brand) plus the Clinique Chubby Stick is worth more than the box itself! So the value is definitely there. I'm happy with the contents plus there's no perfume (yay!). If you would like to sign up for the Allure Beauty Box, you can do that here. That link *should* get you $5 off your first month if you're a new subscriber. 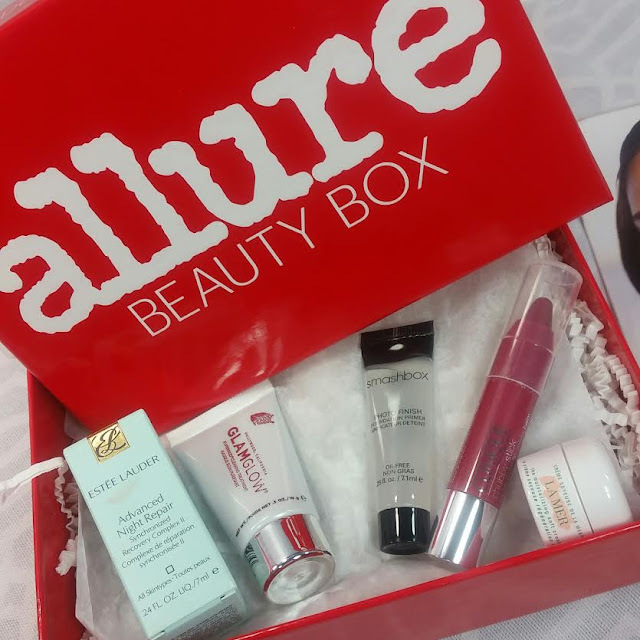 What do you think of the Allure Beauty Box? And would you swap it out for Sephora Play? Which reminds me--- DON'T FORGET to get your entries in for the July 2016 Sephora Play Box giveaway!